Wall site preparation is where we look at laying down the important foundation for building a stone wall. The long term success of your wall will depend on this prep work. Welcome to section four of building a dry stack stone wall. If you are just joining us, we have already covered some valuable information on planning and preparing on how to build a stone wall. Now we are ready to dig our retaining wall base. (You can find the links to the other sections you missed at the bottom of this page). This section is the actual start of physical labor, so hopefully you are all ready to go. You should have a permit (if one was required), you have your utilities marked (absolutely), and you have your base marked with a landscape marking paint. If you have an excessive amount of sod to remove for wall site preparation and other adjoining projects, then I suggest you use a sod cutter. You can rent these at most rental centers. (Make sure you are clear on how to use it before leaving the rental store). A sod stripper will peel up the grass and some of the dirt attached to the bottom depending on what height you have it set at. You can then peel it up and dispose of it, keeping your dirt and sod separate for disposal. This is pretty handy to have if you need to excavate more areas than just your wall base. It will save you a lot of time and energy of having to cut through the grass with a shovel. If you are only excavating a small strip for your wall base, then you probably won't need this particular tool. We only mention it as an option. Some people just have a great eye for drainage and can easily see how water will react to a project when completed. Not everyone possesses this "Eye", so we better cover a few basics to make sure you don't run into problems. For every action, there is a consequence so we don't want you to create any collateral damage here. For example, we don't want you to build a wall that becomes a dam. You have to be aware of all the forces of nature around your wall, and especially behind it on a slope. 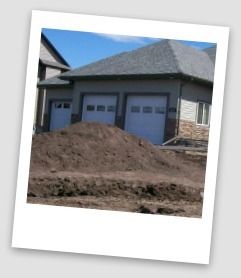 Whether slowly over time from Soil creep, hydrostatic pressure , or quickly after a heavy rain from Slide Planes, soil has the natural tendency to move down hill pushing against your wall. We covered this in the designing section. Look at the big picture. Are there any downspouts, drains, swales, berms, that will direct water towards your project? If this spot has good surface drainage in the yard then you may not have to worry about it. If it doesn't, consider running some drain tile or weeping tile from here to another point in your yard that will drain away the excess water. The more control you have of water at the surface, the less problem you will have beneath it. If you are using perforated drain tile behind your wall then you will want to connect it to something that will drain it away to a more appropriate place. Drain tile or perforated piping is highly recommended for retaining walls more prone to hydrostatic pressure or frost heave. If you need to do a little grading in your yard, now is the time to do it. You can use the steps below on how to use a laser or string level. I understand this can be a bit confusing and difficult to put into words, so you may need to read it a few times. If you have a small tri-pod laser level (or can borrow one and know how to use it) great. You can place the stakes along the wall trench area about 10 ft. or so apart and drive them into the ground leaving about 1.5 to 2 feet sticking out of the ground. Next, take the laser level and shoot the beam across the stakes marking a line on each one where the beam hits the stake. This will be considered the LEVEL mark for the stakes. the line on each stake will show you how far down you will have to excavate. Figure out where you want the base of your wall to be and mark that depth on the stake at the lowest end. If you need 6 inches of gravel sub base then add 6 inches, plus 1 inch for bedding sand, plus the thickness of your base stones. Measure down from this line to get your excavation depth 13 inches. 6 inches of sub base, plus 1 inch of sand, plus a 3 inch base stone that is countersunk 3 inches means 13 inches of excavation. This will have your base stones countersunk and the second tier of stones starting at ground level. Small garden walls do not have to have the bottom course countersunk like a retaining wall. Another way to determine any grade and set your excavation requirements is to use a string level. Tightly tie some string to two stakes at each end of where the wall will be and place the string level on the string. The string should be just above the ground or grass along the length of wall. Have someone move the string up or down at the low end while you watch the bubble. You can mark the LEVEL mark on the stakes when the bubble is level. Repeat this step until you have consistent coverage of marked stakes along the wall length. Giving you a LEVEL line to work with as explained above. You can always double check your slope after it is dug out by placing a garden hose at the highest end to watch the flow of water. Figure out how you are going to finish off your ends? Straight ends can be stacked easily or stepped. However, if you are curving them into a bank make sure you excavate your corners out properly. Prepare for any other features that are going to be tied into your wall. Sequencing your work efficiently will save you time and money. you don't want to repair work that you have already completed. How much back fill will you need behind the wall? You may want to pile some dirt behind the wall when you are excavating. this could save you having to move dirt multiple times or having to move it over top of your work area. Try to have the front of your wall site preparation approximately two to three feet from the dirt behind the wall if possible. This will allow just enough space for your gravel backfill to be placed. Drive some tall stakes in the ground at each end and tie some bright ribbon or caution tape to keep people from falling into you excavation site. Once the wall site preparation is complete, it's time to prepare and set the base stones.